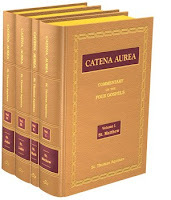 [...] it is impossible to read the Catena of S. Thomas, without being struck with the masterly and architectonic skill with which it is put together. A learning of the highest kind, — not a mere literary book-knowledge, which might have supplied the place of indexes and tables in ages destitute of those helps, and when every thing was to be read in unarranged and fragmentary MSS. — but a thorough acquaintance with the whole range of ecclesiastical antiquity, so as to be able to bring the substance of all that had been written on any point to bear upon the text which involved it—a familiarity with the style of each writer, so as to compress into few words the pith of a whole page, and a power of clear and orderly arrangement in this mass of knowledge, are qualities which make this Catena perhaps nearly perfect as a conspectus of Patristic interpretation. Other compilations exhibit research, industry, learning; but this, though a mere compilation, evinces a masterly command over the whole subject of Theology. Although the text has been entirely reset, Baronius have take great care to ensure that the new edition is in continuity with the original edition published by John Henry Parker (Oxford) & J. G. F. and J. Rivington (London) in 1841. They have followed the page numbers of the older edition so that page references may be easily found, and have reproduced the typographical character of the original. The four volumes are leather bound, with two ribbon markers for each volume, gold blocking and marbled endpapers. This is a beautiful and high quality set. 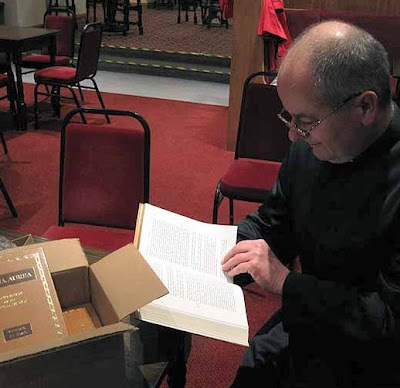 It would make a welcome gift for a priest or seminarian, and a fine addition to any home as a guide to the text of the gospels.